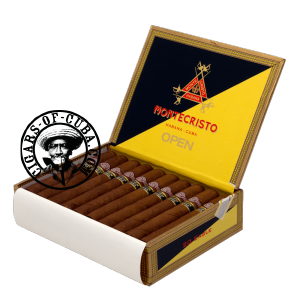 The cigars come with the traditional Montecristo band and a second ring with Golden letters 'Open' and the vitola name. The lighter blend defines a change in the wants of the modern smoker. Dominated by light woodiness and never aggressive, these cigars are the ideal companion cigars to be enjoyed when ever and where ever you wish. Accessible to all, these new generation smokes have brought a breath of fresh air to the Cuban cigar. A cigar devised for outdoor smoking. The bigger ring diameter allows for a slow and long smoke. Dominated by light woodiness and never aggressive. The tasty, light tobacco won't leave you feeling dried out.